The Proposal? Checked. So, what’s next? Pre wedding photoshoot. Yup. Same old song. But let me tell you the truth. In the beginning, me and Dion both agreed not to force ourselves to do any pre wedding photoshoot unless we have extra time and budget. It’s just not our number one priority. But when an offer came from a very good friend, what can we do? Oh dear Benny, you are so hard to resist. Haha! Before we talk further, let us introduce you to our good friend. The witty, super talented photographer of Nomina, cool daddy, Mr. Benny Lim! We called him ‘friend who fall from heaven’. How not too? We met him by coincidence, by ourselves, no one introduce us, but yet from there onwards we become so close. Even me and Benny’s wife, Agnes can get along really well. Few times four of us met and had such a great time together. So when Benny offered us a pre wedding photo session, we straight away said YES. Never in our dream, we could get a chance to work and get photographed by someone like him. It’s truly an honored. Dion is such a big fan of Benny’s works, way before we know Benny in person. It really is a dream come true. Before the photoshoot itself, we met for few times to discuss about the theme, wardrobe and also to get together closely. I couldn’t agree more that chemistry between the couple and the photographer itself is very important. For someone like Dion, it might be not a problem. He does this kind of photoshoot in and out in his daily life. But for me, it’s a brand new world. I am so not used to make up, lighting and camera. So I really thank Benny and also Sylvi, Nomina’s stylist for their time and efforts. They know how to break the ice and handle a newbie like me. Thank goodness! For this photoshoot, I am so lucky to get to know someone like Adi Adrian, one of the best make up artist in Indonesia. Such a humble, fun and very nice person to work with. Nobody need to question his magical works. I was in an awe when I look into my self in the mirror. It’s so soft, natural but yet so pretty. Really love the stupid look in Dion’s face when he look at me in make up. The star got star struck to me. Uhlala. We have four concepts for this shoot. Each concept has its own wardrobe and make up. I felt so anxious in the beginning. The mixed feeling between excited and a bit scared. Scared that I’ll be the one who screw up all this perfect set up by this perfect team. In the very first hour I was still nervous. But seems like Benny and Sylvi can read my mine. They know how to cheer me up and set the right mood for two of us. Me and Dion are so happy with the result. Many friends told us that they love to see the chemistry between two of us. It’s really pure because of the hard work of Nomina team. They know best how to handle their client, set the right mood for the shoot and we also love how they direct us during the shoot. The result? Magnificent. Really can’t wait to work with Nomina again in our wedding day. For you guys who’s planning or going for your pre wedding shoot very soon, allow us to share some tips. The most important you have to choose the right photographer. You have to love and know their style. Each photographer is an artist. They have their own style. If you guys like it then go for it, otherwise you might wanna find someone else. It’s really unfair to force a photographer to imitate other photographer’s work. Trust me, you won’t get the best result either. So once you find the right one, just trust him and work with him. It’s important to break the ice and have a good chemistry not only with your partner but also with your photographer. Second thing, please do prepare some logistic. I am not kidding. It is really exhausting. It’s a one day affair. You guys should hydrate yourself well and don’t forget to eat. Specially for the bride to be. Trust me, you won’t actually feel it. We’ll be non stop juggling from the studio, the make up room, back to studio again, pose for hours, another touch up for make up and change the wardrobe again then back to studio. The more concept that you have, the more you have to repeat these step again and again. So, remember to drink plenty of water okay? I believe everyone wants to look on its best, isn’t it? Last but not least, enjoy and cherish the moment. Beautiful make up and dresses won’t look perfect without your smile and happy face. One other thing that someone ever mentioned to us is about chemistry. Nobody would be able to fake it. So talk to your partner, enjoy your time together, it’s one in a life time experience. Show the love to the world. Happiness is real when its shared. So does love. Share the love and be someone’s reason to love again today. Cheers! 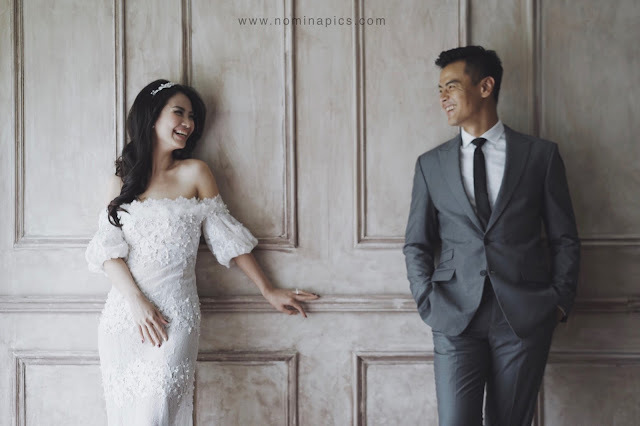 Wahh artikelnya bagus gan, silahkan mampir di mari ya Jasa Foto Video Wedding Pernikahan banyak diskonnya. Hi everyone! Thanks for visiting our page. This blog belongs to Dion Wiyoko and Fiona Anthony. The Wife (Mrs Bake) and the husband (Mr Pack). Basically this blog represents two of us and two of our hobby, baking and travelling. Most of the writing done by me, the wifey, while my husband is the one who’s in charge of the photography (which also his current passion). Hope you guys enjoy our blog! This blog is about Dion Wiyoko and Fiona Anthony. We would like to share our daily life together with our hobbies which are baking, travelling and photography.